We are engaged in manufacturing, supplying, and export of Patterned Pulley Laggings. These are manufactured in compliance with the international standards using quality raw materials. We also offer these in customized specifications as per the clients’ requirements. Crescent Tear (N/mm ) 40 Min. to 80 Min. We offer a comprehensive range of Patterned Sheet Pulley Lagging to meet conceivable conveyor installation requirements. These are fabricated in different thicknesses, rubber qualities and patterns to ensure selection of the most appropriate type and meet the application requirements of our clients. Our range comprises CN Bonding Layers for better adhesion levels along with diamond or square embossing profiled patterns on the top surface to improve belt grip and tracking on conveyors. 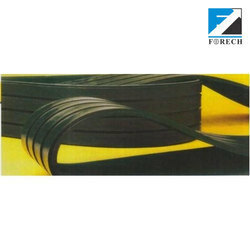 These are available in various grades of rubber, including FRAS and White Nitride for packaging and foodstuff carrying belts. 5 Abrasion Loss mm3 90 Max 140 120 Max 200Mx.